This story was presented at the year-end-party of Palestine Peace and Solidarity in South Korea on 7th December 2017. Dina is from Beit Sahour, Bethlehem and she’s studying Korean in Seoul now. This is my story about how I came to love the Korean culture and why I decided to learn Korean. I was first introduced to the Korean culture when I was in elementary school when a Korean missionary and his family moved to Bethlehem. Their oldest son, Simon, became my first Korean friend. In middle school, I asked him to write down the Korean alphabet for me on a piece of paper. I held on to that paper hoping that one day I would get the chance to learn this language. In 2011, when I was a sophomore at Bethlehem University, I got the opportunity to go to Korea for the first time as an exchange student. When I arrived at Incheon airport, I only knew how to say hello and thank you. The school I was going to was located in a city that is five hours away from Incheon by bus. Halfway through the bus ride, we made a rest stop. As I was not sure how much time I had to use the bathroom and buy a snack, I stood from my seat and asked the strangers around me. A kind gentleman told me I had 15 minutes. Fast-forward to the end of the ride. After we got off the bus, that same gentleman came up to me and asked me if I needed help to get to my dorm. He helped me drag my suitcases and find a taxi. It turns out, this man was a part time professor at the university I was going to, he spoke Arabic, and he knew the Korean missionary family living in Palestine. That day I learned how small the world is and I saw a glimpse of the true kindness of Koreans. In the short four months that I spent in Korea, I learned a bit of the language, but more than that, I fell in love with the Korean culture. I was determined to learn more; so in 2015, one month after graduating from Bethlehem University, I was back in Korea working on my master’s degree. When I am in Korea and I say I am from Palestine, the most common response I get is “Pakistan?” Even when I try to explain, “Palestine, the Middle East, near Jordan, Lebanon, and Syria,” I am usually faced with a blank expression of confusion. When applying to events or filling out forms online in Korea I am rarely able to find Palestine on the list of countries. Even on official forms, my nationality is usually listed as 기타(other). Even when I am in Palestine, I try to stay involved with the Korean community there by being involved at the Korean Cultural Center. I used to teach K-pop dance and perform with my team for local and Korean guests. Whenever we would have Korean guests at the center, I would spend time with them, introducing them to my country and culture. Just as much as I was eager to learn about Korea, I was excited to help visitors learn about my country. However, the more I tried the more I was faced with disappointment. Another similar incident was when we welcomed a team of volunteers who were offering acupuncture sessions to local Palestinians. This time, the volunteers were older. At the end of each day, we would all have dinner together and pray. One particular lady seemed to like me. She held my hand during prayer and asked for my contact information. Again, after the group left, she started sending me text messages about how she will continue to pray for Israel. Most of the Korean visitors I met in Palestine would go home and make posts on social media saying how their experience in Israel has touched their lives. They did not mention being in Palestine at all. I was frustrated because I had tried my hardest to share with them the situation in Palestine and explain to them the difficulties that Palestinians go through, but it seemed like my efforts had gone to waste. In the end, I realized that it is my job, as a Palestinian, to educate the world about my country. Since I love Korea so much, I decided to start there. Although both times I was in Korea, I learned a bit of the language, it was not enough. That is why I decided to come back for a whole year just to focus on learning the language. I hope by the end of this year, by learning Korean, I would have taken my first step toward becoming the first Palestinian ambassador in Korea. On July 26, over 150 people gathered in Seoul, South Korea to condemn the ongoing assault on Gaza and demand an end to the illegal Israeli occupation of Palestine. With testimonies from Palestinians, a powerful performance, several “die-ins,” and a march past the Israeli embassy, the demo attracted positive attention from passers-by in downtown Seoul. The rally began with a performance in which participants solemnly laid white flowers on an enormous Palestinian flag, in memory of the more than 1,000 people, mostly civilians, killed in the current attack on Gaza. A series of speakers, including Palestinians living in Korea, described the devastating impact of Israel’s current operation and the constant violence of the occupation. Demands included a halt to Korean arms sales to Israel, a suspension of diplomatic support of Israel, and, more broadly, an end to the current attack, the crippling siege of Gaza, and the occupation of Palestine. After staging a “die-in” of dozens of people, the group marched through central Seoul, with several more die-ins along the way. The hundreds of people who received fliers from the marchers were, in general, receptive to the message of solidarity with Palestine. Though police arbitrarily prevented protesters from marching directly in front of the Israeli embassy, they were able to pass within shouting distance. The embassy has been the target of all-day “one-person” protests every day since July 15, which will be maintained until Israel ends its assault. Weekly rallies, which began on July 19, will also continue to be held every Saturday. This Saturday’s action was organized and supported by a range of South Korean pro-Palestinian organizations, unions, and political parties. A large contingent of foreigners, especially from the Muslim and Arab world, also took part in the demo. Palestine Peace and Solidarity in South Korea is extremely concerned to learn that South Korea has agreed on a deal to purchase more non-line-of-sight (NLOS) Spike missiles from Israel’s second largest government-owned defense company in Israel, Raphael Advanced Defense Systems. The Korean government originally purchased 67 of the missiles from Raphael back in 2011 in a deal worth US$43 million. The new deal was announced by the Defense Acquisition Program Administration on January 10 which stated that they would be used on eight new AgustaWestland AW159 Wildcat maritime attack helicopters the government ordered in January of 2013 which can carry a total of four Spike missiles each. The missiles are going for around US$300,000 a piece. First jointly developed in 2005/06 by Rafael and the U.S. Navy in 2005–2006, the missiles are electro-optically guided and can deliver anti-armor, penetration blast fragmentation and fragmentation warheads to a range of up to 25km (15 miles). The original batch of Spike missiles are currently positioned on Baengnyeong and Yeonpyeong Islands near the North Korean coastline, following North Korea’s shelling of the latter in 2010 in response to joint US-South Korean war games exercises conducted near the border. Palestine Peace and Solidarity in South Korea is deeply concerned about military transactions between South Korea and Israel in light of the ongoing human rights abuses committed by the IDF in its occupation of the West Bank and blockade of Gaza. According to Defense News, while the technology was only declassified in August 2011, Raphael’s missile was first used in Gaza in 2005. Spike missiles were also deployed by Israel in its 2008/09 Operation Cast Lead assault on Gaza in which 1,389 Palestinians were killed (a figure which includes 759 civilians and 318 children) and more than 5,300 wounded. In a 2009 report on a selection of six Israeli drone strikes in densely-populated areas that resulted in the deaths of 29 civilians (including eight children) during Operation Cast Lead, Human Rights Watch’s own inspections revealed that “the impact mark of the missile and the fragmentation pattern were consistent with the Israeli-produced Spike missile”. Rafael recently acquired 49% of Korean communications company PineTelecom which develops military technology for the Korean defense market, and also produces the Iron Dome missile defense system which it has been trying to sell to South Korea for over two years. The Israeli government-owned arms manufacturer was originally established by the Ministry of Defense in 1948 to develop missile technology, netting US$148 million in profits in 2012. The company is heavily complicit in the ongoing occupation of Palestinian land, boasting that its “know-how is embedded in almost all Israel Defense Forces (IDF) systems in operation today”. Also a major concern is the fact that South Korea is also considering the purchase of additional variants of the Spike for combat helicopters to be developed by Korean Airspace Industries (KAI), a deal which could be worth over a billion US dollars. Defense Update is reporting that the Lahat missile from Israel Aerospace Industries (IAI) is one of the missiles being considered. Palestine Peace and Solidarity in South Korea calls for a full embargo on the purchase of all Israeli made weapons in light of the ongoing occupation and flagrant disregard for the rights of Palestinians and international law. The purchase of such weapons only further fuels the occupation by expanding the business and increasing the profitability of Israeli companies like Rafael, which are wholly dependent on Israel’s war economy. In addition, such purchases only deepen the militarization of the Korean peninsular and make diplomatic solutions that might eventually lead to a peace treaty being signed between the two Koreas increasingly unlikely. SodaStream sells carbonation machines for home use and markets itself as an environmentally-friendly company. What many do not realize is that SodaStream is produced in a factory inside Ma’ale Adumim’s industrial park. Ma’ale Adumim is the largest illegal settlement in occupied Palestine. Israel’s illegal settlements are often identified as the largest obstacle to any peace process, but there are clear incentives put in place by the Israeli government for choosing to carry out your business in the illegal settlements including tax deductions. In addition, the factory employs a number of Palestinian workers who must get special work permits and security clearance to enter and who are not offered the same protection as Jewish workers. Due to massive unemployment resulting from the Israeli military occupation of the West Bank, Palestinian workers have few employment options. One Palestinian employee of the Ma’ale Adumim factory has been quoted as stating that Palestinian workers are forced to work in slavery-like conditions. Movie actress Scarlett Johansson has recently found herself in the spotlight and under pressure from human rights organizations for promoting SodaStream’s ‘blood bubbles’ and therefore herself profiting from the occupation after becoming SodaStream’s first Global Brand Ambassador on January 10. The controversy stems from the fact that Johansson is not only endorsing a company widely condemned by Oxfam and many other human rights organizations but that she is also currently a global ambassador for Oxfam. Following criticism, Johansson responded by defending SodaStream and even went so far as to suggest that it was contributing to “peace between Israel and Palestine”. Oxfam is currently considering her role with their organization, but many are disappointed that it has not already severed ties with the movie star, including the grandson of the charity’s founder who is calling Johansson an “ambassador for oppression”. While Johansson has taken part in a commercial for the company filmed for a spot during this year’s Superbowl, JTA is reporting that Fox has rejected the commercial, apparently because it referenced major carbonated drinks companies Coke and Pepsi. SodaStream products are widely available in South Korea but few members of the public are aware that its machines are produced in an illegal settlement and profit from the ongoing occupation of Palestinian land and exploitation of Palestinian resources. We urge you to visit SodaStream’s South Korean Facebook page and express your opinion SodaStream’s business practices. While you’re at it, you might also want to let Oxfam know how you feel that they have not yet dropped Johansson as their own spokesperson despite issuing these clear statements condemning SodaStream’s business practices. We also urge you to write directly to Johansson’s support staff to let them know how you feel as CodePink has kindly set up this page. 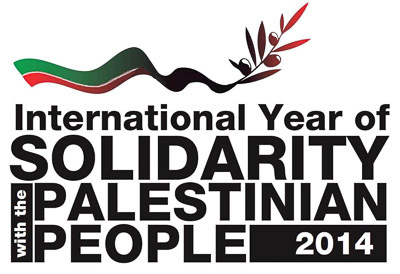 promote solidarity with the Palestinian people as a central theme, contributing to international awareness of (a) core themes regarding the question of Palestine, as prioritized by the Committee, (b) obstacles to the ongoing peace process, particularly those requiring urgent action such as settlements, Jerusalem, the blockade of Gaza and the humanitarian situation in the occupied Palestinian territory and; (c) mobilization of global action towards the achievement of a comprehensive, just and lasting solution of the question of Palestine in accordance with international law and the relevant resolutions of the United Nations. While we celebrate this important milestone in international support (which hasn’t really shifted in any way in the past 40 years), another important event is taking up much more of the spotlight. 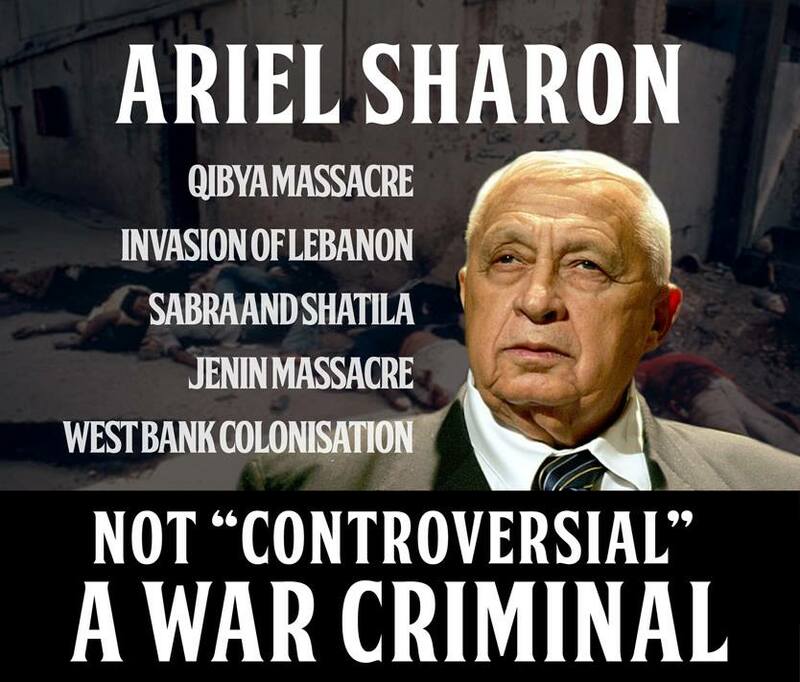 Much of the world continues to mourn the passing of a man many if not most outside of Israel regarded as a war criminal of the first degree, former Israeli Defense Minister, Prime Minister, “bulldozer”, butcher and self-proclaimed “warrior” Ariel Sharon. Image made by Ben White and Doc Rocket. Indeed, there is a great sadness to his death as pointed out by Human Rights Watch, one of the international human rights organizations who wanted to see him in the docks, in that justice will never be served for his numerous crimes. The piles of Palestinian bodies in Sabra and Shatila refugee camp in Lebanon in 1982, the apartheid wall dissecting the occupied West Bank, and the consolidation and expansion of colonial settlements in East Jerusalem and West Bank are all elements of a legacy that should not be forgotten. Here is an interesting discussion by Noam Chomsky and Rashid Khalidi about his legacy. Here Robert Fisk and others who were present at the time reflect on Sharon’s responsibility for the slaughter in Lebanon in 1982 as Minister of Defense, a role that saw Sharon deemed unfit to hold public office by his own state. Sadly, it appears that this was quickly forgotten. Lest we forget. Again.